The Edwardsville Township recently signed a contract with the Flight Deck Veterans Group to restore the U.S. Navy A-7E Corsair II located at Edwardsville Township Community Park. Now that we are getting ready to complete the restoration project, we need your help! We need you to tell us your story. What is your connection with our A-7 Corsair? What memories do you have to share of visiting the park and seeing the plane? We want to see any photos you have of our A-7 Corsair and we want to hear all of your stories! Not only do we want to hear memories of our plane, we also want to hear of any connection with A-7 Corsairs that community members may have had in their military service. 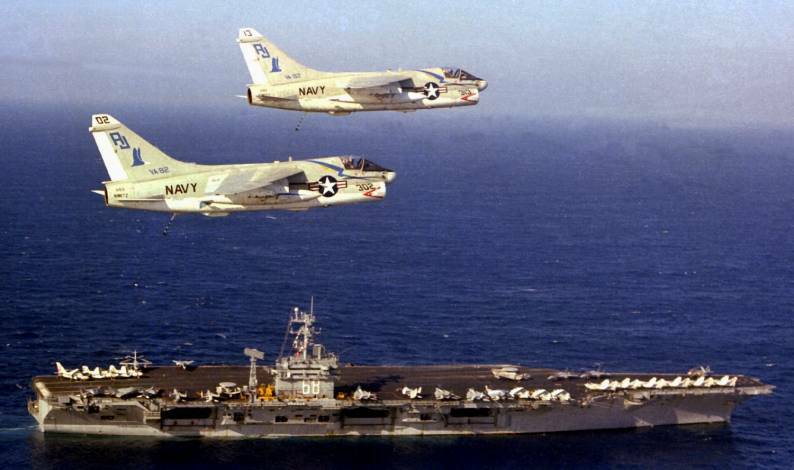 Do you have any memories of other A-7 Corsairs during your military service? Did you manufacture or repair A-7 Corsairs? Did you assist with flight deck operations? Have you ever flown an A-7 Corsair? We hope to hear how everyone in our community is connected to our A-7 Corsair. Please leave your memories to share with us in the form below, we would love to hear from you. If you have any photos of our A-7 Corsair either at the park or when it was being delivered please share them with us by emailing them to township@edwardsvilletownship.com. Are you comfortable with us sharing your story? Yes. Yes but please keep me anonymous.